All files submitted in the VideoHive Element 3D Project File category must be prepared for commercial use. Since all the Element 3D Project Files are also After Effects Project Files, it is important to follow the requirements outlined in this article while creating your Element 3D project. This article contains supplemental instructions that should be followed in addition to the standard After Effects Project File submission requirements when creating an Element 3D Project File. Please note Element 3D templates must be created using the most recent version of the plugin at the date of submission. Project assets must be properly linked before submitting the project file. Do not include pre-rendered assets that have been made using Element 3D. All assets, including materials, shaders, environment maps, lighting setups, and models must be included in the project zip folder. All assets intended to be replaced must be provided with an included placeholder image. Please note failing to include a valid help file can result in a soft-rejection by our review team. Sometimes, Element 3D projects do not link up properly when opened in different user’s computer. To help customers to deal this issue, you will need to provide a documentation on how to use the Element 3D relinking tool when the project is first opened. This way we can ensure that all the assets are linked correctly. 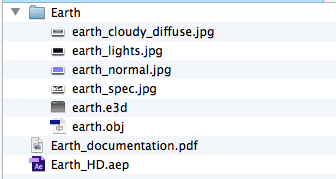 List of all the materials and their passes (diffuse, illumination, and so on).